6.2L Diesel Engine, Automatic Transmission, 4x4, 7,700 lbs. 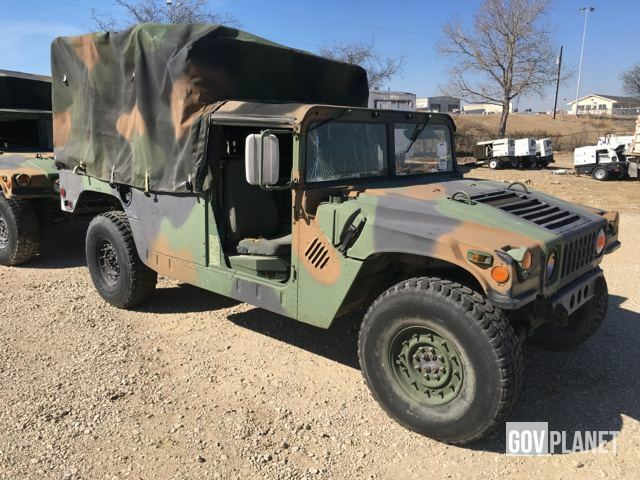 GVWR, 2 Door, Soft Top, Cargo Cover, Cargo Cover Bows, Cargo/Troop Carrier Body, 37x12.50R16.5 Tires. ***Buyer will need to complete and submit a Hold Harmless Agreement before scheduling pickup. ***No further demilitarization is required. The HMMWV is available for pick up as shown. ***Please see DLA supplied Tire Safety Warning document below. *** No load outs will be available between 3/11/19 – 3/15/19. Mirrors The left mirror is missing. Click here to open photos and videos of this item. Exterior Lights The right headlight is missing. Click here to open photos and videos of this item. Odometer 26,688 Miles - IronPlanet makes no guarantees as to actual hours/miles; we can only report what can be visually observed. Click here to open photos and videos of this item. Cooling System Leaks The radiator cap is missing. Click here to open photos and videos of this item. Limited Function Check The engine is incomplete and could not be operationally checked. All fluids have been drained and the batteries are missing. Limited Function Check The drivetrain could not be operationally checked. The rear driveshaft is missing. The front driveshaft has been disconnected. Limited Function Check The main chassis components were not operationally checked.